When you need the space and comfort of a minivan, but don't want to sacrifice style and design, the 2016 Volkswagen Touareg has just what you need. 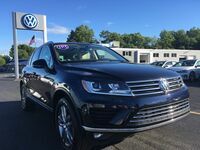 Coming in this year at a lower MSRP and with more features and an improved infotainment system, the Touareg is a family vehicle that is made to turn any drive into a comfortable and convenient experience. With the Touareg, family road trips or even just a trek across town can become the enjoyable ride that every driver wishes they had. Looking at the exterior of this eye-catching SUV, it's clear that the designers at Volkswagen were thinking of their drivers when creating the style. Clear cut lines and distinct features give the Touareg the look it needs to stand out in the SUV segment. The simplistic and defined grille and headlights separate this SUV from other options on the road, while the shape allows for the most effective use of space. Under the hood, the 2016 Touareg comes standard with a V6 engine that puts out over 270 horsepower. Whether you need to tow a boat or handle tough road conditions, the 2016 Volkswagen Touareg has your back. An all-new infotainment system setup offers the driver of the 2016 Touareg better graphics and improved connectivity with smart phone software like Apple CarPlay and Android Auto. A spacious interior offers drivers the choice between two rows and five seats, or three rows and seven seats. Versatility means that you have the option between more cargo space, or room for family and friends. If you are packing for a trip, there's always a place for your cargo in the 2016 Touareg. With over 60 cubic feet of cargo space with the seats folded, you are sure to have the room you need to pack for adventure. When it comes to the interior, there are a number of new and improved features that make time inside the 2016 Touareg enjoyable and convenient. The all-new MIB II infotainment system makes it easy to take advantage of smart phone technology and enjoy media while behind the wheel. The high-quality eight-speaker sound system is combined with Bluetooth technology to take away the stress of cords and poor audio quality when you listen to music. Other great features include comfortable leatherette seat trim, heated front seats and side mirrors, and safety features like a rear-view camera and parking assist. Inside the 2016 Volkswagen Touareg, there's a lot to love and even more to enjoy. If you are interested in being one of the first lucky test drivers of the 2016 Volkswagen Touareg, be sure to give us a call or schedule a test drive appointment online. Our experienced professional staff is always happy and prepared to answer questions you may have regarding inventory or the simple and easy financing process here at Joe Heidt Motors. We look forward to hearing from you soon! Interested in a 2016 Volkswagen Touareg?